At the foundation of every successful move are sturdy moving boxes, packing materials, and the useful moving tips offered by our experienced storage professionals. We understand, moving is hard work. However, you can make it less stressful by planning ahead. Once you decide on a moving date, the next step is to choose the best moving boxes. Why? Not all boxes are created equal. Boxes made for shipping grocery items are not as sturdy as boxes made for moving and storage, and finding used boxes that are not damaged or contaminated with bugs or food residue is time-consuming. All Metro Self Storage facilities give you the time-saving convenience of one-stop shopping for a wide selection of well-priced moving boxes and packing supplies to protect your items—whether they are on the moving truck or in a storage unit. WHY SHOULD I BUY MOVING BOXES? Whether you are moving across town or across the country, we make it easy to pack the items that matter most in your life with Metro Self Storage moving boxes. You may think of boxes as a luxury expense, but it is worth the investment because it safely transports and helps to preserve your belongings. Moving box sizes are standardized, which means they stack well together. Choose from small, medium, large, and extra-large boxes, rather than working with whatever sizes are available. Specialty moving boxes are specifically designed for a purpose, such as wardrobe boxes with built-in hanging rods. Quality boxes provide the right type of protection for fragile items and are sturdy enough so that they won’t collapse as easily under the weight of other boxes. Boxes used for shipping food and alcohol or other merchandise are intended for temporary use, whereas purchased moving boxes can be used and reused in many imaginative ways. When you are finished with your boxes, you can donate them, recycle them, or sell them. We make it easy to purchase your moving boxes and packing materials at all Metro Self Storage locations. Our friendly storage team can help you select everything you need in one trip. Quality moving boxes will make packing your items faster and lessen the chance that items will get broken or damaged during a move. When choosing a box to place your belongings in, keep in mind that somebody will have to pick up the box once it is fully packed. How easy will the box be to transport? Will items get damaged? A good rule of thumb is that a filled box should not weigh more than about 30 pounds. Follow our tips for packing your moving boxes and keep in mind, you can find a full range of moving supplies including boxes, bubble wrap, tape, and locks at all Metro Self Storage facilities. Before placing anything in your box, spread a layer of packing peanuts or crumpled newspaper or packing paper on the bottom of the box to add extra shock absorption for fragile or breakable items. Group items of similar size and weight together in the same box. For example, books are heavy and should be packed in sturdy small boxes that are taped together with strong tape. Moving and storage tape is a thin, sturdy tape that is water resistant and very sticky, which makes it ideal for cardboard boxes. Remember that you will need to secure the tops and the bottoms of all your boxes. A member of our storage team can help you determine how much tape you will need to purchase for your moving or decluttering project. Dish pack and glass pack kits are specialty boxes designed for moving fragile items. They come with cardboard dividers or foam pockets for easy packing. Wardrobe boxes are oversized boxes that come with a hanging bar so you can load items from your closet directly into the box. These boxes are suitable for curtains and draperies in addition to linens including comforters, pillows, and large stuffed animals. Place heavier items at the bottom of your box and lighter items at the top. Wrap the heaviest items with bubble wrap or packing paper and separate the lighter items with another layer of packing peanuts, foam, or crumpled paper. Before taping your box closed, fill in the empty spaces with crumpled paper or linens to prevent items from shifting while in transit. Professional movers use shrink wrap to keep furniture doors and drawers closed during transit. For added protection from scuffs and dings or if you are placing items into a storage unit, drape furniture with a moving blanket and then wrap with shrink wrap. Be sure to prepare your furniture before placing it in a storage unit and to remove shrink wrap if the plastic is in direct contact with furniture. Mattress covers and sofa covers are designed for short-term protection of your furnishings. So not leave sealed plastic covers in place for the long-term storage to avoid moisture that can promote the growth of mold and mildew. Our storage facilities offer a variety of packing supplies, boxes, locks, covers and other handy items. Any member of the Metro Self Storage team is a great resource for creative ways to get the most out of your moving supplies. After all the hard work of moving and unpacking, get in touch with your inner child or give the kids hours of entertainment by repurposing your moving boxes into cardboard toys or games. Used boxes can also be sold at a discount or donated to a charitable organization or an elementary school. Before your next move, you may decide to hire professional movers. Even so, experience tells us that most people will pack all or some of their belongings. 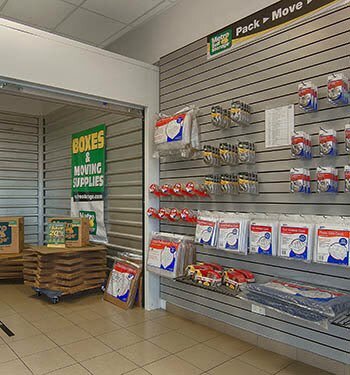 We offer a wide selection of packing supplies and moving boxes for your added convenience at all Metro Self Storage locations. We opened our first storage facility more than 40 years ago and continue to provide conveniently located full-service storage facilities with outstanding customer service. We invite you to pick up the boxes and supplies you need for your moving or organizing project when selecting your storage unit.